Surveillance cameras at Lafferty Chevrolet in Warminster, Bucks County recorded a suspected tire slasher as he moved from pickup truck to pickup truck damaging vehicles in the dealership's lot on Street Road. A tire slasher is on the loose in Warminster, Bucks County, according to investigators. 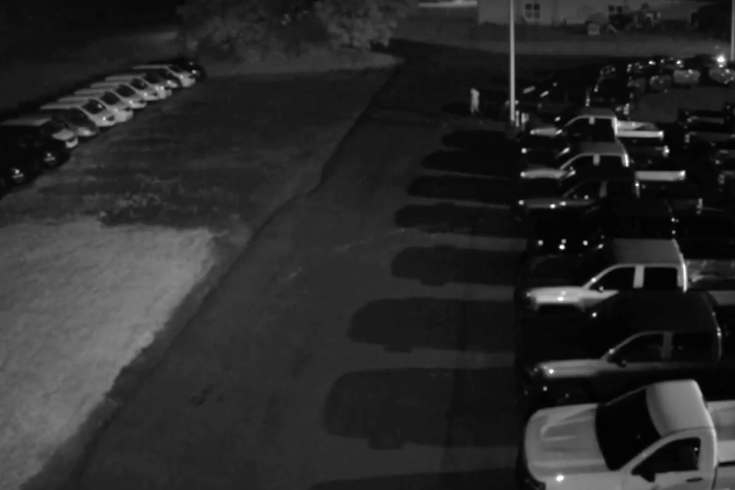 The vandal struck as many as 50 vehicles parked at township businesses in at least six different locations, Fox29.com reported. The total number of tires punctured is at least 170. Among the locations where vehicles were damaged is the Lafferty Chevrolet dealership, 829 W. Street Road. NBC10.com reported more than 20 vehicles there had tires slashed. Security cameras at Lafferty Chevrolet recorded the suspect as he moved from pickup truck to pickup truck. Some vehicles can be seen sinking as their tires deflated.